Launching a successful blog site can be an avenue to personal freedom and financial independence, all from the comfort of your own home. However, as you start down this road, it is important to remember that running a blog site, even one centred around a topic that you are passionate about, can begin to feel like just another office job. One way to avoid these doldrums is to keep your content fresh and engaging. If you stay excited about the topics you are covering, chances are, your readers will too. Creativity is the fuel for longevity in the blogging business. Too many bloggers become burned out and fall back on repurposing old posts over and over again. By keeping a fresh perspective, you will keep your content dynamic and be less likely to rely on stale ideas. If after review, you realise that the frequency of publishing new posts is spreading your material too thin, then scale back. Is there a thread of discussion that keeps occurring in your site's comments? Or are there certain topics that always spark a lively discussion? Listen to the cues that your readers are sending to you, and when you are creating new blog posts, consider their perspective. Think about how you can share new information and insights with them on these popular topics, thinking about how to meet your reader’s needs will keep your perspective fresh and the words flowing. Blogs rely on blogs. This is a known axiom in the blogging world. Whether you are a big link sharer or track-backer, or you just enjoy reading fellow bloggers' sites, it is undeniable that good blogs do not operate in a vacuum. Consider a guest blogger for your site, or even better, suggest swapping duties for a day or so. In addition to approaching a different topic or angle, their readership will likely have a completely different, and inspiring, dynamic than your own. The written word, while powerful, can become two dimensional at times. Break things up with the occasional podcast or video entry. These two mediums also lend themselves very well to collaboration, and approaching familiar topics from a very different point of view. RETURN TO THE WELL - IS THERE A FAVORITE TOPIC THAT YOU FEEL LIKE YOU'VE NEVER QUITE COVERED AS YOU HAVE WANTED? There is always that one subject (or two) about which we never feel we give the attention it deserves. Review old posts for those one or two favourites that you have always wanted to tackle with a deep dive. Take the time, do the research, ask some questions, and give your readers a comprehensive and informative post. Continuous learning is one of the tried and true ways to stave off complacency and boredom. In addition to new technologies and enhanced research, asking an expert is another great way to expand your understanding of a topic while you enlighten your readership. Experts in their fields usually love to share their knowledge and are another great way to stay engaged in a subject matter, expand your own horizons, and get some fresh, exciting ideas. Keep on learning. This applies to all aspects of life, not just blogging. The more you read and discover and expand your perspective, the more creative you will feel. Your blogging will remain on point, and as you satisfy this curiosity and thirst for knowledge, your writing will reflect a greater dynamism. Have you had the idea of starting a blog kicking around in the back of your mind for a while? What are you waiting for? Now is the perfect time to get started! You can learn how to start a blog quickly and conveniently with step-by-step guides, so even if you know nothing about it, you can become an expert in just a few days. 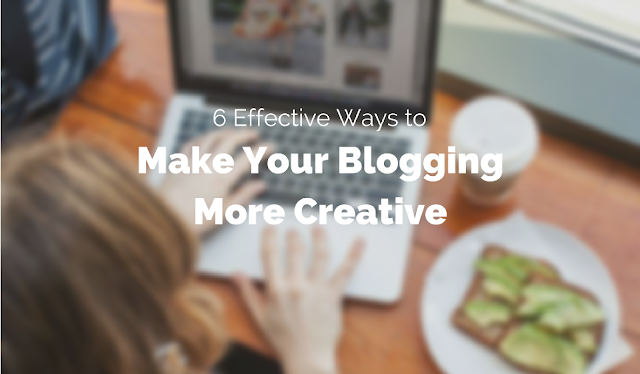 If you want to make your blogging more creative, try adapting some of the above tips when you next get to work. You’ll find it much more stimulating, and your readers will enjoy it too!